Here are a few pictures of some recent orders. I love being asked to do new color combinations or new designs. Mary asked for some mittens to match the newborn hats she was purchasing…I love how they turned out! Also remember any of our hats can be done in adult sizes. Contact us at oikoshandmade@gmail.com for more information. 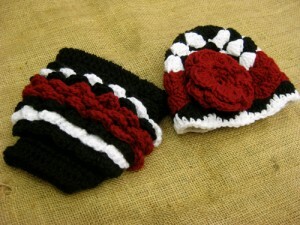 This hat and diaper cover were done for some Bama fans.